To say that we kicked off our 2-week trip to the States during Chinese New Year with a BANG! is a major understatement. Within 4-hours of landing in NYC, Brett asked me to marry him…and I said YES! So for all the romantics out there (but mainly for our friends and family – and who am I kidding, I want to have all the details in writing!) 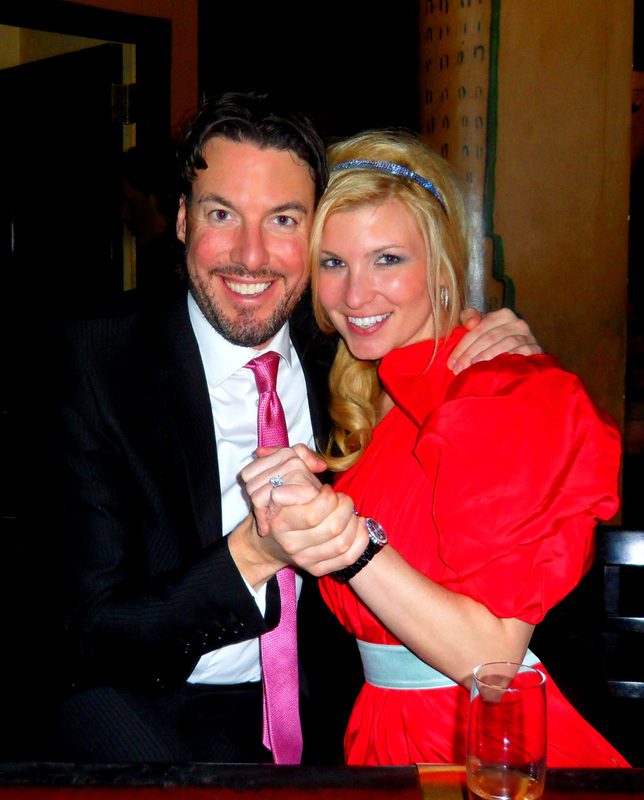 – I would love to share the story of how my wonderful new fiancé popped the question. Apparently, unbeknownst to me of course, his process began in late October when he started a search for the “stone”. Props to Chris Carioti of Carioti Jewelers in Columbus, Ohio who managed to find exactly what Brett was looking for from 6800 miles away. It took several months of back and forth via email (Brett only saw the ring in person for the first time just minutes before proposing) but by December Brett knew the ring would be ready in time for our trip to the States – so he put his proposal plans in motion. He started by giving me two nights in a suite at the Carlyle Hotel, a New York institution and home to Bemelmans Bar – where we met, in my stocking on Christmas morning. This was one of his ways of throwing me off the scent! The sudden increase in the number of “ifs” when referring to our future was another tactic…which (btw Brett) I could have done without! Brett continued planning for the big night with the incredible help of Fred Petry, manager of the Carlyle. 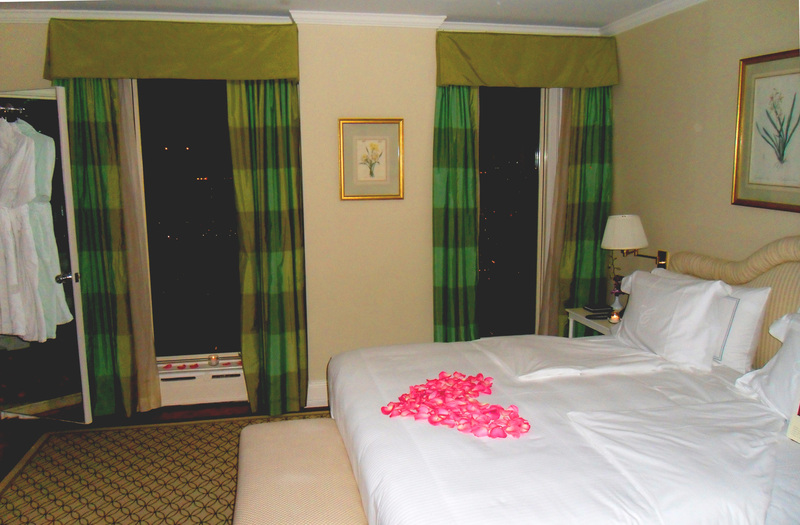 I just want to say that Fred and every employee of the Carlyle from the concierge to the elevator operators were absolutely spectacular in every possible way. Even upon arrival (looking like homeless rag-a-muffins and smelling like plane after our 14-hour flight from Beijing) we were greeted with the utmost respect. 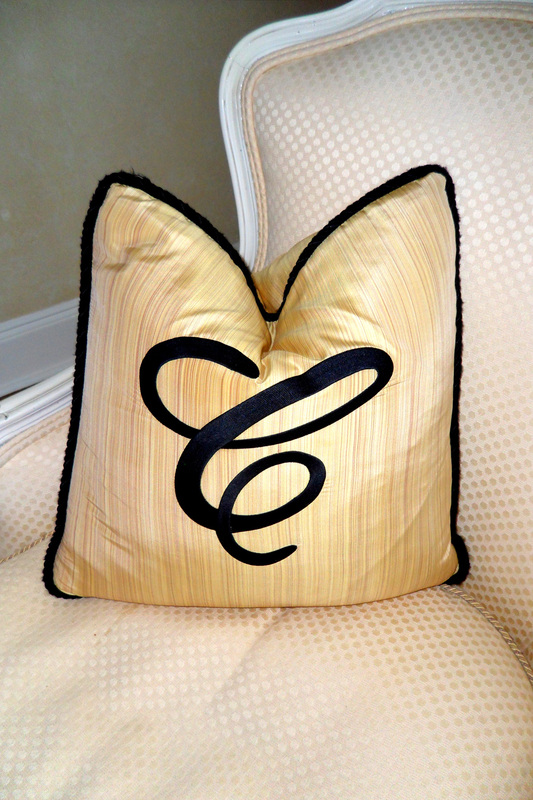 Albeit – possibly because the comedian Elaine Stritch (a longtime resident of the Carlyle) was collecting her mail at the check-in desk while we were checking in, and she sarcastically wished us good luck “staying in this dump”. The look of fear on the staffs’ faces – unsure if we knew the famous comedian or not was a bit entertaining. as I explored the room – but Brett wanted nothing to do with it. In fact – he was noticeably rushing me…something that he just doesn’t do. Mainly because he is a sweet and patient man – but probably also out of defeat that it doesn’t really work. 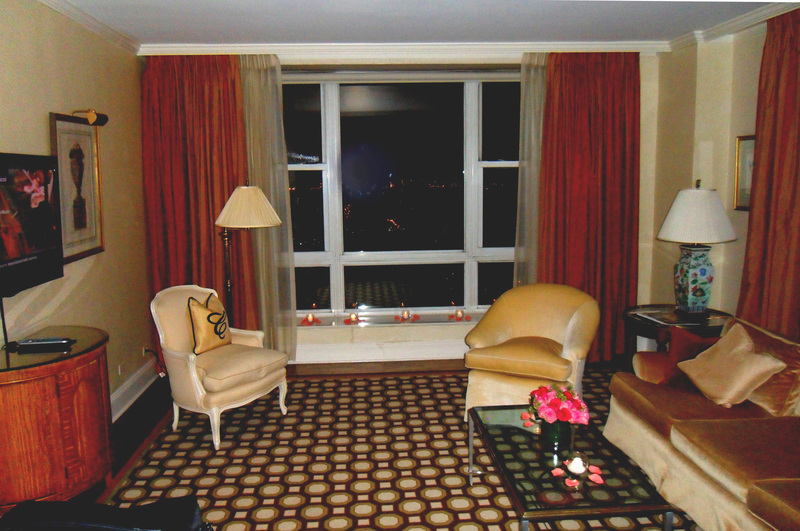 After getting fancied up, I suggested we enjoy a pre-cocktail hour cocktail in the comfort of our darling living room overlooking Central Park. He apathetically agreed and then proceeded to drink his as if it were a shot. Needless to say – I was seriously confused. We had been planning to make this a “date night” for weeks knowing that the next day would commence our world wind trip of trying to see every single person possible all across the country. I finished my drink faster than normal (trying to keep up) and we headed downstairs to Bemelmans. Sweet treats in the room! Countless hugs and kisses later (not at all creepy like Michael Scott and Holly during last week’s PDA episode of The Office) the celebration began with pink champagne and mini burgers. 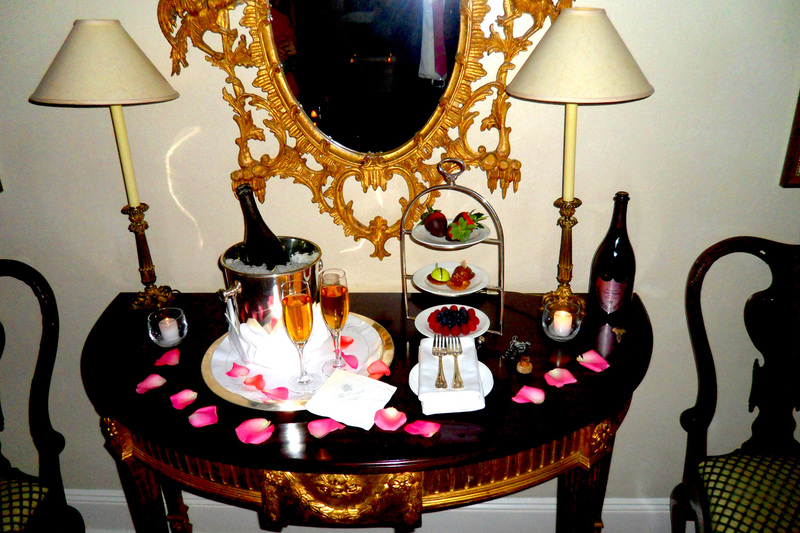 After filling me in on all the details of his planning process, we headed back up to the room for “more surprises”. 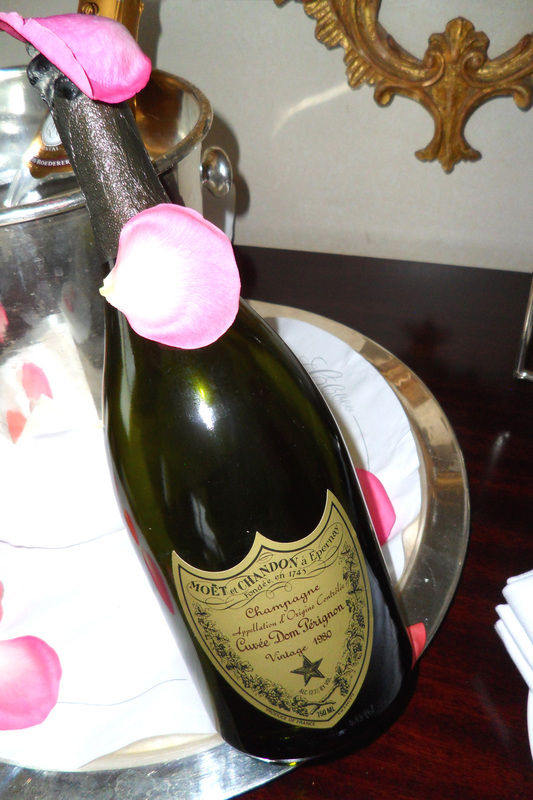 While we had been toasting and calling family at the bar – the engagement elves had filled our room with hundreds of candles, pink roses, rose petals, chocolate treats, and a bottle of 1980 (the year of my birth) Dom Pérignon that Brett special ordered. So thoughtful, right? We stayed up into the wee hours of the morning (it was easy with the help of our jet lag) talking, planning, and toasting to our future. 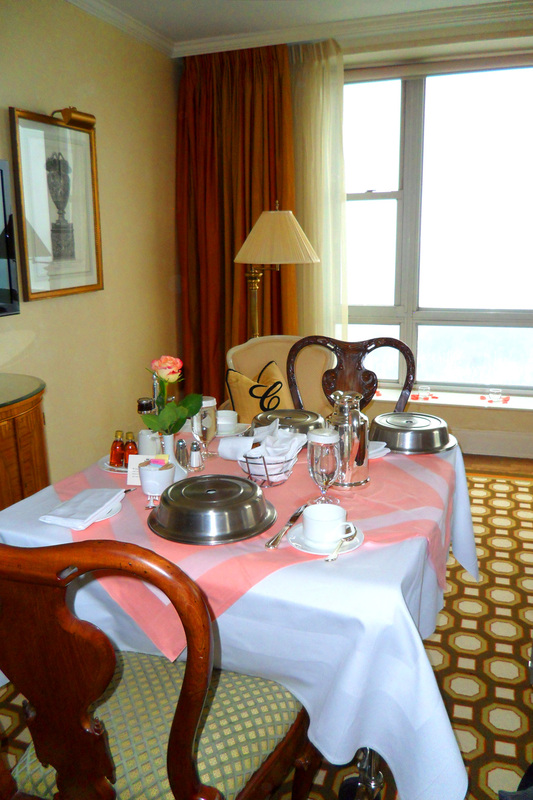 And in the morning – the only appropriate thing to do was to continue the celebration with room service. It was a perfect night. I am an extremely happy and an incredibly blessed lady! And, obviously…I forgave him for rushing me! The Morning After Breakfast...Everything Frette! Morgan, I feel so so happy for you. Send you my blesses and hugs from my office. You are perfectly match. Congratuations!!! I love you guys, and I’m so happy for you 🙂 congratulations, you really are a wonderful couple!! congratulations morgan, so beautiful!! excited for you and brett..sending all my love & celebration. big hugs! That is a great story, Morgan! Congratulations! I know I told you this when I saw you two a couple of weeks ago, but “congratulations! and best wishes!” May you both be blessed with a long and wonderful marriage!! Be sure to let me know when you set the date :)!!! LOVE THE DETAILS…AND THE PICS. FELT LIKE I WAS THERE …GUESS YOU’RE GLAD I WASN’T! HA!HA! The story is beautiful, you both are beautiful, the ring is beautiful, getting to see you was beautiful…I love everything beautiful!! 🙂 Congratulations again! late wishes but sincerely wishes out of my heart. I met you and Brett when you just became Brett’s girl friend not for a long time. I remember that time you two were so excited, which even made me jelous of your sweet faces. So I hope you two in the rest of life keep this sweet and excited face forever! !